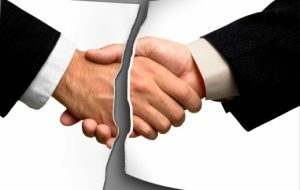 You may think first about disagreements amongst partners, but a contract dispute can arise with a customer or a vendor too. These disputes can bring financial instability and threaten a business’ future. Thomas, Ferguson & Mullins has handled a wide range of contract disputes including breach of contract and lease disputes. Often such disagreements can be resolved through negotiations, but we are prepared to litigate your case if that’s what is required to get the best possible results. Dispite all efforts to address potential issues in writing, the speed of business today delivers new complications which could not have been predicted when a well-drafted contract was executed. As a result, most contract disputes originate in the language of agreements–including the business formation documents. Every business drafts contract to protect its interest, but there comes a time when those contract must be legally enforced because one party fails to keep its part of the agreement. When you find yourself in this situation, our contract dispute attorneys are ready to protect your best interest. We’ll attempt to resolve your situation through negotiation or mediation in a timely and cost efficient manner. Should your case require a trial, we’ll be ready for that! One client’s complex contract dispute went to trial resulted in a $8,700,000 jury verdict. We have a deep bench of lawyers with a long tenure in complex commercial litigation. Our litigators have extensive experience appearing before the North Carolina Supreme Court and North Carolina Court of Appeals, as well as statewide experience with the trial court judges in the United States District Court, county Superior Courts and the North Carolina Business Court. Our litigators also have extensive experience in resolving breach of contract claims through arbitration and other forms of alternate dispute resolution. At Thomas, Ferguson & Mullins you’ll get personal attention from your attorney. Remember, we’re not just attorneys–we’re business owners too. We understand that a contract dispute can ruin a business. It can force business owners and corporate officers to fire or lay-off employees. We’ll do all we can to ensure that doesn’t happen to your business. Our attorneys provide effective counsel for contract disputes in the courtroom and boardroom alike.